Look, I know that as a business owner, office administrator, or practice manager you get emails from people that you don’t necessarily immediately recognize. It happens to everyone. By the same token, you’d be hard pressed to ignore an email that was sent in response to one of yours. That is unless, of course, you didn’t send the original email. 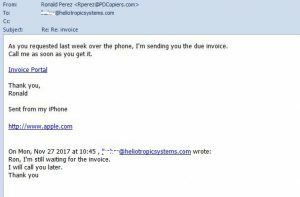 I was quite surprised to see an email from Ronald Perez telling me about an invoice. More so because he included my text regarding a call I was going to make to him. Unfortunately, the “original” email is fake. I always close with the word “Thanks!” and have a closing email signature. Neither of which appear in this email. Looking very closely at the link, it goes to some confabulated address that I’m sure would attempt to ask for a user ID and a password – if it didn’t first attempt to download a key logger to track my future movements over the internet. It is the very start of the holiday season, so please look carefully at the emails that you receive – BEFORE you click on the link. And if someone is asking you to pay for something you didn’t order, simply delete it.